For the last week or so we have been traveling about in a grey Vauxhall Transporter. This vehicle does not have an auxiliary input for iPods or any other type of music playing device to connect to, this meant we had to listen to music in the old compact disc format. Good golly. This constraint on our approach to listening was, for me, a positive one. It was a constraint which opened up opportunities, instead of listening to the same playlists over and over again or choosing your favourite new find, we could share old and new albums and listen to them, as they should be, from start to finish. OuVanPo. I'm going to show you a few of the albums that we have listened to over the past week or so and choose my favourite song from each of them. From one of the first “space rock” albums Hawkwind (1970), here is Hawkwind's 'Be Yourself'. This album is great for driving to, as are most of the Hawkwind albums. In a van, when you have nothing to distract you, an album like this lends itself to the environment and you can fully immerse yourself in the experience. It certainly makes the M1 seem a little more exciting. William Onyeabor, Who is William Onyeabor? From William Onyeabor's Who is William Onyeabor?, here is 'Heaven & Hell'. Our good friend, eternal fountain of wisdom and all around great guy Henry brought along this album to play in the van. I was sitting up the front with him as he was driving and I inserted the disc into the van's little mouth expecting nothing that interesting to come out, but it was great. Released on David Byrne's label Luaka Bop a few years back, this album is a must for driving, give it a listen. In 1970, Ian McDonald and Michael Giles from King Crimson recorded an eponymous record, here is the song 'Tomorrow's People'. If you haven't heard this album, I urge you to straight away. From start to finish, preferably in a van. Inner Space are Can before Can became Can. Here are the most accessible songs from the record Agilok & Blubbo. I managed to pick this CD up in Tower Records, Japan. I was pleased to find it, as I had only heard the song 'Kamera Song' before buying it. This might be a difficult album for some to listen to, as it has a lot of the experimental aspects of Can and only a few pop tendencies as shown above. Another highlight of the album is a song called 'Flop Pop'. Someone brought along the new Toy record Join The Dots. We had all heard it before and listened in our own separate ways, but not as a band. I think it is an excellent record that again works from start to finish. Another great driving record also. Everything seems to be, apparently. My personal favourite is the second song called 'You Won't Be The Same', it is a beautiful pop song which goes to unexpected places with strange chord sequences and a brilliant vocal melody in the chorus. Go and buy it! I thought I'd end on an album that is yet to be played in the van. It may be too late, we may have to revert to playlists and convulsive song flicking. I hope not. This record is packed full of delights. It is a rock version of the old Russian story and Prokofiev's Peter and the Wolf. Vivian Stanshall, the great British eccentric, narrates the story, along with greats such as Brian Eno, Bill Bruford, Phil Collins, Gary Moore, Manfred Mann, Gary Brooker and others providing the music. It was first thought up by Jack Lancaster and Robin Lumley. It is a bit of a silly piece of work, but nevertheless impressive and entertaining with some great sounds. 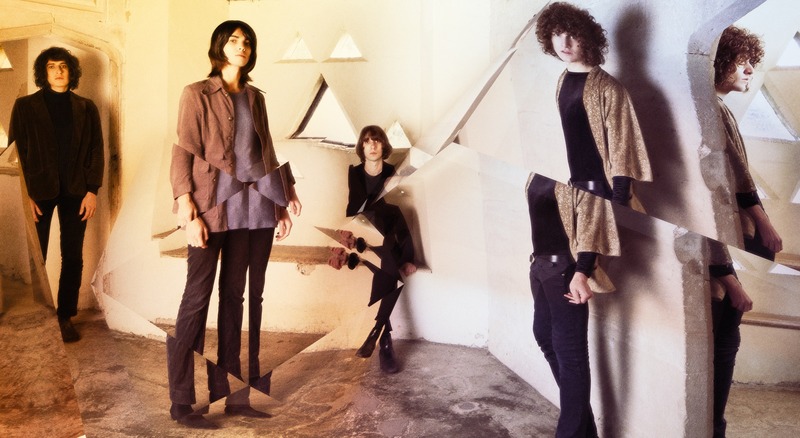 Temples' Sun Structures is out now on Fat Possum.